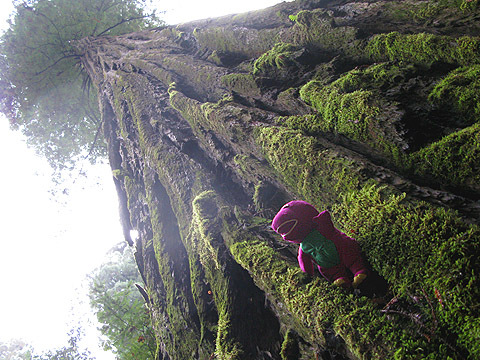 Working his way down the Left Coast, Barney took time out just south of Miranda to hug some of the Giant Redwoods. 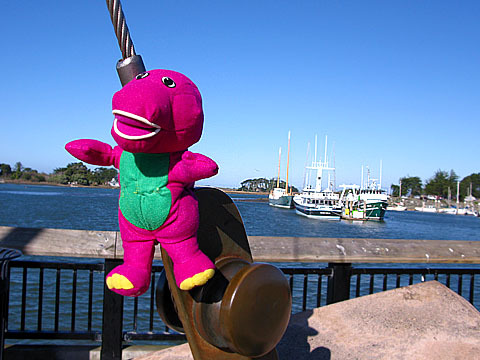 After making it to the Great Green North, the little purple vagabond worked his way down the left coast … taking a moment to enjoy a rare beautiful day on Humboldt Bay. Barney needs to blog more often. WTF? 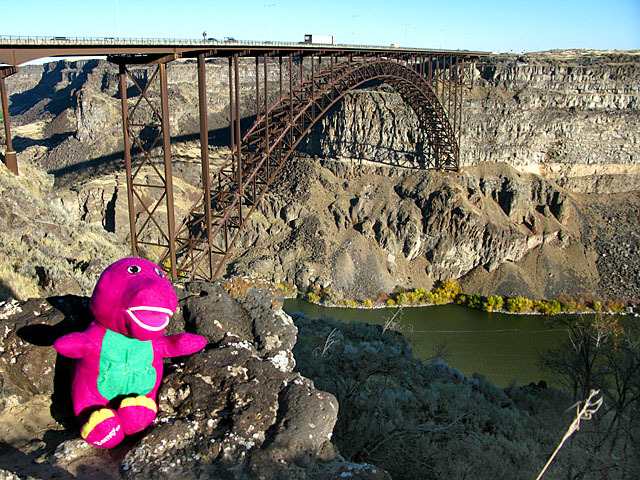 Who woulda thunk he tried to go all Evil Kinevel on the Snake River at the Highway 93 Visitor’s Center in Twin Falls, Idaho? Yah, like months ago! 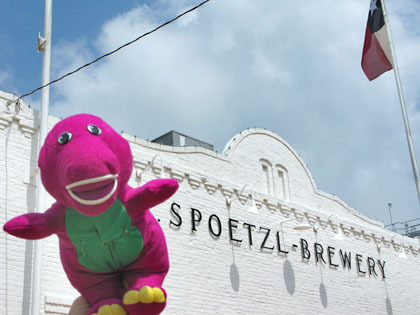 Unlike that other Barney on tour, this little purple guy is apparently a slacker. But he sure does get around. 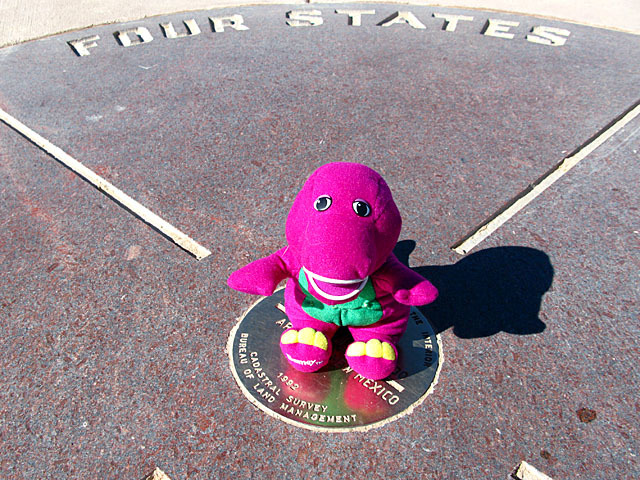 Barney’s first roadside attraction after heading South for the winter was Four Corners, for the stereotypical photo op in all four states. Don’t tell him the monument is in the wrong place! He’ll prove to you that it the Four Corners location is legally correct. 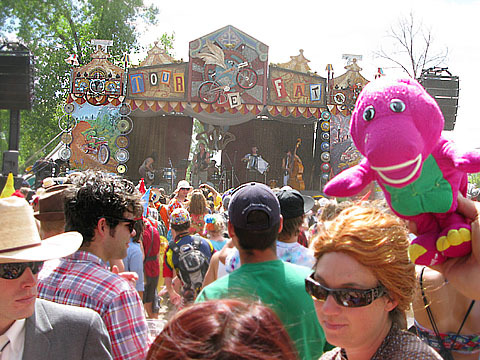 Before Barney hit the road again, he had fun at the 2010 Tour de Fat in Fort Collins, Colorado, the home town of New Belgium Brewing. 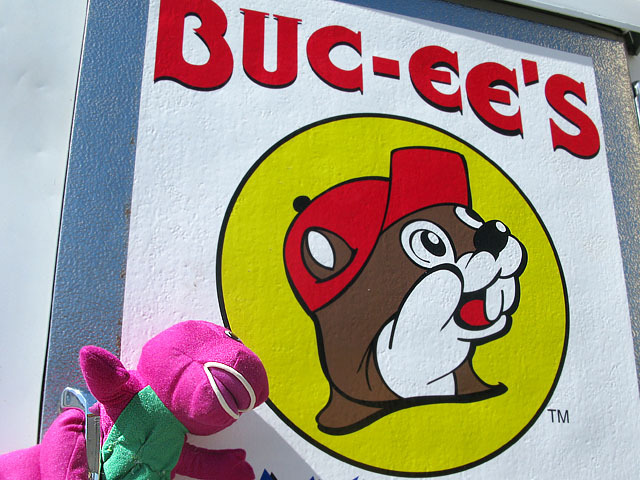 He’s been on the road a while, but falling behind on his blogging, so stay tuned for updates from this little purple vagabond! I Wanna Be An Airborne Barney! 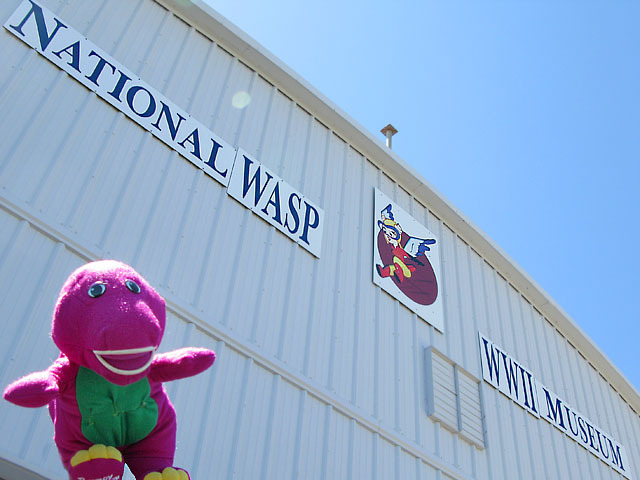 Our little purple friend forgot to share this photo from his visit to the National WASP WWII Museum in Sweetwater, Texas! 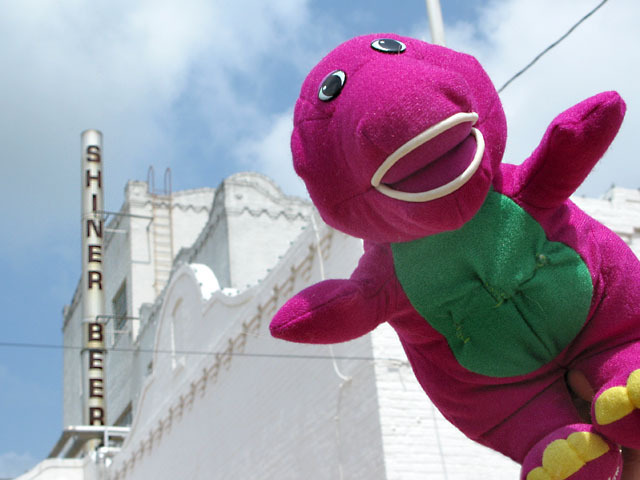 While heading North after so many beers in Shiner, Barney held it for miles to wait for the cleanest restrooms in Texas. Well, he wasn’t stumbling when he got there. 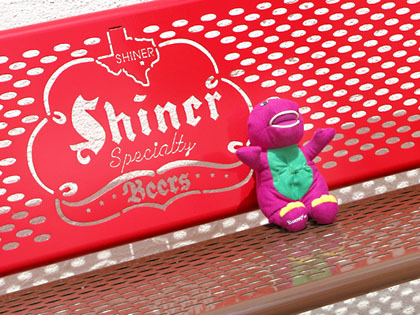 But after a few tastes of Shiner Bock, Shiner Black, and Shiner Blonde he definitely needed a rest. 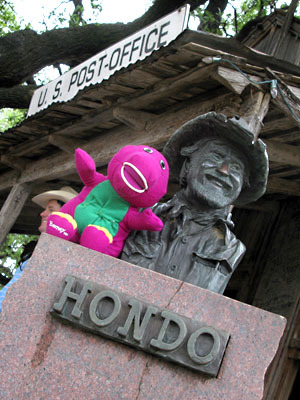 Stay tuned for more from Barney’s travels across Texas. 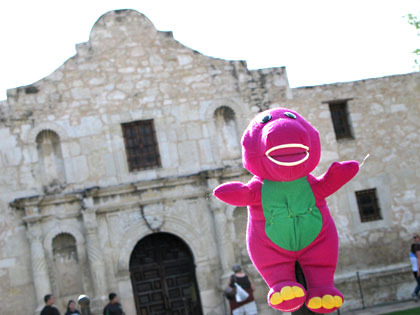 Wyatt has laid claim to FrankenBarney, and Jerry’s good ol’ smelly Barney doll is off on a tour of his own now.